Technically, Sorin can be considered a four-mana reanimation spell – I don’t even know when the last time we had that was. Of course, he’s restricted in such a way that you won’t get much of a discount until about the time you would be casting high-end creatures anyway. I actually think Sorin has good prospects for finding a niche in more aggressive decks. His static ability is much bigger than it looks: giving lifelink to a herd of tokens makes it hard for aggro opponents to attack you or race you, and he can easily keep things coming back forever against removal-based decks. I’m also really looking forward to seeing what he can do with Chandra’s various incarnations and their massive damage-dealing output. Looks like Sorin managed to make his way out of that rock after all. The rare planeswalkers in War of the Spark have, in addition to their static ability, two abilities (usually a + and a – ability). 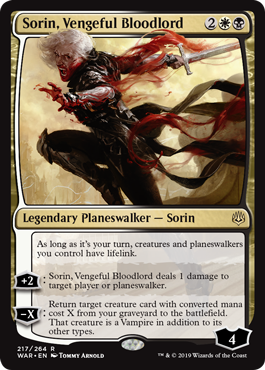 Sorin fits that mold, giving all your creatures and planeswalkers lifelink on your turn and doing things beyond that. Lifelink is generally an ability with a lot of subtle power to it; it’s not going to win you the game on its own, but a lot of incidental life gain makes it harder for your opponents to kill you, and giving everything lifelink is really nice. Sorin himself has a pretty powerful – ability: bring back a creature as a Vampire from your graveyard. Being able to tick up by 2 with his first activation means that you can reanimate a six-drop on that next turn without anything else going on. He also can keep planeswalkers from popping off with their ultimates (or other powerful negative abilities), giving you some life in the process. He is by no means a format-warping or defining card, but there’s a lot to like about Sorin; he is a reanimation spell that gives all of your creatures (and planeswalkers) incidental life gain, and any Orzhov deck might like his combination of abilities. Four mana also is priced to move, so I can see him going places.